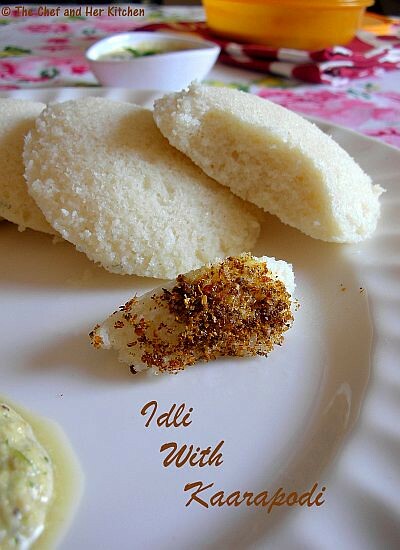 Idli is the most humble breakfast in many south Indian homes,though I do not make it on a daily basis I do it regularly at least once in 2 weeks.I usually prefer the Idlis made out of Idli Rice as I like the taste and texture of Idlis better than the Idli rawa ones.Today I am posting the idli recipe with idli rawa which helps people who don't get idli rice and also those who don't have wet grinder. 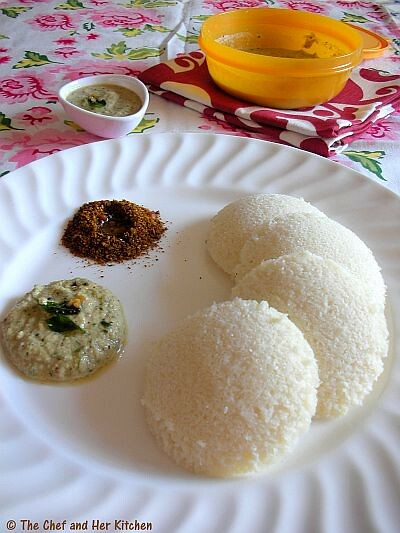 Idli might sound a very simple tiffin but it needs lot of practice to get soft, fluffy and airy idlis.In spite of being a south Indian not everyone can be able to succeed in making good idlis.There are many factors which decide the quality of idli like the quality of urad dal or idli rawa and the climatic conditions and the procedure of grinding the batter using a grinder or mixie.I have shared few tips based on my experience and advice from elders to get soft idlis,I hope it would help you.This recipe is meant for beginners and hence I tried to mention in more details. Soak urad dal and fenugreek seeds in water for 3-4 hrs. Soak poha and idli rawa in water separately for 2 hrs. Drain the water from urad dal and fenugreek mixture and squeeze out extra water from poha and idli rawa and keep them separately. Gring urad dal and fenugreesk seeds mixture along with poha to a very fine and smooth mixture in wet grinder.Add little water in between for easy grinding.It takes approximately 15-20 mins.To test whether the urad dal is ground or not drop a little portion of urad batter in a bowl of water,if it floats it means your urad dal batter is well ground. Add squeezed idli rawa to the urad dal batter and grind again for 5 mins.Do not add much water,but if water is required feel free to add water to get thick and semi smooth consistency of batter.This step is optional,you can mix the soaked and squeezed idli rawa directly into the urad dal batter,but I prefer to grind it further to a semi smooth batter as it give fluffier idlis. Take out the batter into a big vessel and add salt to it and mix it with hands,cover it with a loose bottom plate.Take care that the batter comes to half the height of the vessel as the batter doubles after fermentation.It is believed that the heat in hands helps in speeding up the fermentation process.Some prefer to add salt while making idlis,so it is left to you when you want to add but please do not forget to add salt. Keep the vessel in a warm place.As I stay in India I leave the batter outside for 8-9 hrs or overnight for fermentation.If you stay in col regions it is better you leave the batter in a preheated oven overnight. Once the batter is fermented it might have doubled in size.Do not over mix the batter,take the batter how much ever you want into another vessel and keep the remaining portion refrigerated until its next usage. Now check the consistency of batter,if you feel the batter is very thick add little water.If you did not add salt while grinding add it now and mix well. Grease the idli plates and switch on the steamer with enough water.I use my cooker and steam without whistle(weight).Pour the idli batter upto 3/4th of idli impression and place stack up all the idli plates and steam for 10-12 mins.Rest it for another 3-4 mins. Dip a clean wide spoon in water and remove the idlis from the plate.Keep dipping the spoon in water in between which helps in taking out the idli easily. Serve them hot with either coconut chutney /peanut chutney/tomato-onion chutney/karapodi/chutney podi/allam pachadi/sambar. Use an air-tight container for storing the batter.I usually remove the batter into my tupperware container and cover it with a normal loose steel plate while it is fermenting and once it is fermented I cover it with the lid and refrigerate the batter,this way the batter will be fresh and does not turn sour. I prefer to use whole urad dal,if you do not get it use regular ural dal(broken). Addition of poha is optional but it gives you very soft and fluffy idlis.You can even use a handful of sago instead of poha for the same.. If the quality of idli rawa and urad dal are good you get soft and fluffy idlis.I generally add 3 cups of idli rawa(to 1 cup urad dal) as I use priya brand which is apparently very good.If you do not get that try the proportions like 1 cup urad dal : 2 1/2 cups idli rawa and if even this proportion does not give you soft idlis try 1 cup urad dal : 2 cups idli rawa. If you are using wet grinder you can go up to 3 cups of idli rawa for 1 cup of urad dal,but if you are using mixie to grind the batter I suggest you to go with the proportion of 1 cup urad dal: 2 cups idli rawa. You can use the same batter and make dibba rotti(means thick dosa),add lots of oil while frying it which gives crispy and crusty dibbarotti. so soft idlis !! love to have with podi & ghee !! so soft n spongy idlis, looks yum..
Rawa idlis look soft and yummy...I too prefer rice idlis over these..
Soft and super spongy idlis looks fabulous, thanks for sharin this way. the first picture is so tempting Prathibha.comfort breakfast. Thanks the platter is so delicious. The black powder is Guryellu powder? can you share the recipe? Nice idea of including Idli rawa, will try this this weekend. did u use raw rice rawa or boiled rice rawa.the recipe looks good, should try. idli looks good. did u use raw rice rawa or boiled rice rawa. This is the one I have been looking for !!! I got Idli Rawa at home and I stay in usa, in a very cold place :( .. My idlis turn out a little non-fluffy, was wondering why (of course I dont make them on a regular basis ! ) ... Anyways, shall surely give this version a shot and let you know !! :) Tkx a lot!! .. 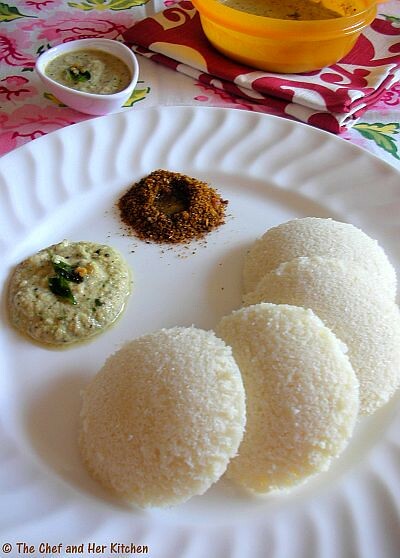 Perfect idlis. Wish I can have these now for BF. Tempting platter. love that last pic, it looks so soft & fluffy! very detailed explanation given Prathibha. Great effort. 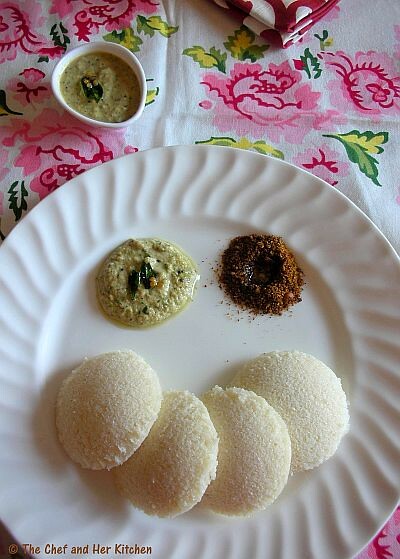 Fluffy and yummy looking idlis with chutney and milagai podi. I am single person. for single person as only small amouont is prepared,wet grinder is nuisance. can I grind urad dal(preferably broken dal) in mixie. I am having Preeti steel. how long do you think this should be ground. or you think mixie is no good for Idli. Wonderful recipe. Thanks for sharing it!! The idlis look so soft and fluffy. Have you ever tried making idlis in chinese style? If not and interested in the recipe, visit my blog. You can make the idlis in your style but, to give it a chinese punch you can explore my recipe. Hi..nice receipe..but can you tell how many Idlis will come out from this? nice receipe.but can you tell how many idlis will come out from this proportion. Do not use an air tight container for the batter. Formation needs yeast in the air, and its best to use mixing bawl covered with a kitchen serviette, and place the mixture in a oven, preheated for 170F and switched off. Keep the oven light on. @Anonymous .. while fermenting I cover it with a loose steel plate and once it is fermented I keep it in tupperware,this way it stays fresh and does not turn sour...I have updated these points in my notes,thanks for pointing it out. I tried your recipe for Idlis and they turned out extremely moist and delicious. This is the first time that I have been able to get the idli batter to ferment so well and quickly!FYI - I used the Methi seeds and Poha. @Shruti - Thanks for the feedback,I am glad that u got it nice..
yes, the idlis turn out awesome with ur step by step procedure. thanx for all the effort u put in for this blog, which is helpfull for all of us. 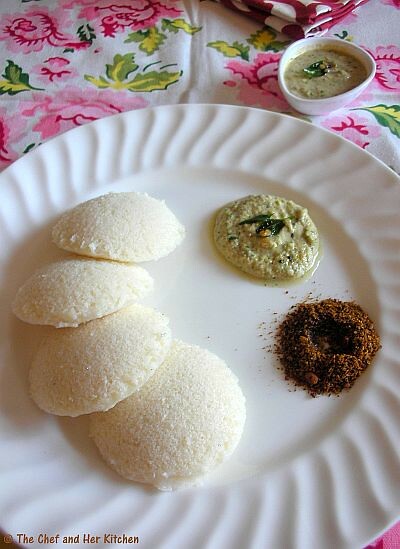 the idlis look like they are out st from the hotel kitchen and served to u at home. in case the idli batter becomes watery, what is the remedy? @nikila...if it becomes watery add a bit of regular sooji to it and mix and also add a pinch of cooking soda to it and mix well and prepare idlis. Very reliable and productive information.Thanx had good results.